Discover what happens when the only thing more dangerous than finding the truth is exposing it, when Exposed fires onto Digital HD, Blu-ray (plus Digital HD), and DVD (plus Digital) March 29 from Lionsgate. Ana de Armas (Knock Knock), Keanu Reeves (John Wick), and Academy Award winner Mira Sorvino (Best Supporting Actress, Mighty Aphrodite, 1995) headline this intense thriller, which also features compelling performances by Christopher McDonald (Happy Gilmore), Big Daddy Kane (Blade: Trinity), and Laura Gómez (Netflix’s “Orange Is the New Black”). As a police officer investigates the death of his partner, the case exposes disturbing police corruption along with a dangerous secret that leads him to a troubled young woman. A mix of fantasy and cop story, Exposed is the story of a cop who is trying to solve the murder of his partner. Scott Galvan is a loner police detective whose partner is murdered on a subway platform. As he searches for the killer, he finds his partner wasn't such a great guy... he's been accused of some not so honorable things and the list of suspects is long. Galvan works the case and as he interviews the suspects, they end up dead. When Galvan finds some surveillance photos which include a young girl, he begins searching for her. Soon, he realizes that this girl knows more about the murder than anyone suspects, but protects her by not bringing her in for questioning. Isabel, the young girl, is married to a soldier who has been deployed in Iraq does the last year. His family has taken her in and she works at the family daycare/school and attends prayer group regularly. One night, after being out with her husband’s recently released from jail brother, she takes the subway home and sees an amazing thing. As her mind begins showing her these "angels," she finds out that she is pregnant. When she tells her family of this miracle, they of course doubt her fidelity to her husband and throw her out. Isabel returns to her parents, with whom she has an estranged relationship. When she sneaks a young girl from the school home, Elisa, Isabel's mind is shown to be less than sane and she reveals her secrets -- both in her past and about her pregnancy. Exposed is two individual stories that by the end of the film intersect. Normally, I'm not a fan of this spilt story, but the way the writers and director brought them together was done really well. As the stories progress, you begin to see where they are going to come together and why the separation was necessary. 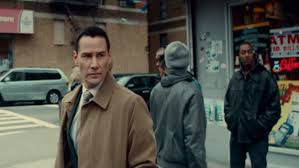 Keanu Reeves was good as Detective Scott Galvan. He was both tortured and lonely and really showed his dedication to the role and the story. Ana de Armas was wonderful as Isabel. Her visions, her feelings and the sympathy you felt for her really brought her character to life. De Armas made you question your beliefs and then realize that her visions were the makings of a girl who has many secrets. First-time director, Declan Dale brought the story to life and immersed the viewer in the story. I found myself invested in these characters, especially Isabel. The story was well-written, well-directed and realistic. The 1080p high definition widescreen presentation was really good. The picture was gritty in the right spots and more fantasy like in others. The color palate was spot on and skin tones were natural. The picture was clear and sharp and there were few issues with the picture itself. The English 5.1 DTS-HD master audio was okay. In many scenes the volume level is low, but the dialogue is good. The background music is haunting and at just the right level so as not to be distracting. I enjoyed the making of feature and the behind the scenes interviews with the cast. Rife with spoilers, I don't recommend watching the interviews before watching the movie. Making Exposed (12:08) -- behind the scenes of the movie. 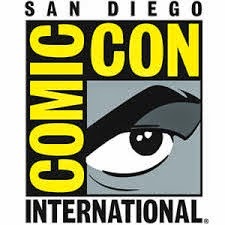 Includes interviews with the cast and crew, this feature talks about the story, the characters and the events that lead to the outcome of the story. Cast interviews -- each interview includes thoughts of the character from the cast member, how they became involved with the project and their relationship with each other. 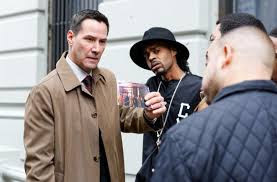 Keanu Reeves’s movies lately haven’t been palatable, but Exposed is an interesting story. I enjoyed watching the two stories intersect and figuring out the ending. It wasn’t a totally predictable ending, even though I figured out part of it just before it was revealed. 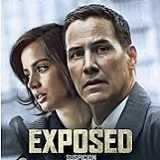 Exposed is a movie I’ll be sure to watch again. I wasn’t sure I was going to like it, but I was pleasantly surprised at home much I enjoyed it.